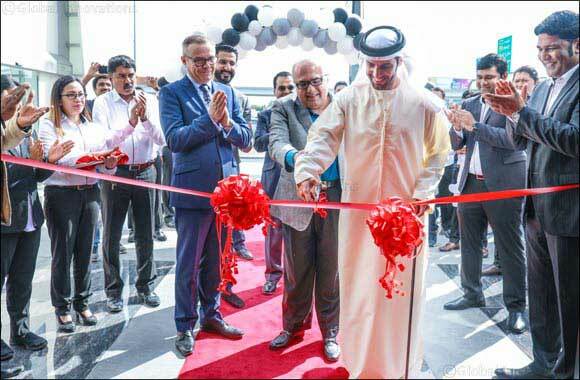 Dubai, UAE, December 12, 2018: V-KOOL™ Emirates, the global leader in the high-performance premium window film market for both automotive and architectural glass, announced the opening of its flagship store at AWR Business Center with a renewed Car Care concept; in the presence of an elite clientele, channel partners, Eastman Chemicals Ltd and senior management from KAPICO Group, the group holding company of AUTO1 – Car Care Division that is a master franchisee for V-KOOL™ for UAE, Oman & Kuwait. The outlet was inaugurated jointly by Mr. Vipan K. Handa, Deputy Group CEO & Board Member-KAPICO Group, Mr. Andrew Vickers, Commercial Manager – EMEA for Advanced Materials – Performance Films of Eastman Chemicals Company and Mr. Ranveer Handa, CEO – KAPICO Group. The megastore, conveniently located in Al Rostamani Business Center, on Sheikh Zayed Road (besides Infiniti Car showroom), showcases the most complete car care product range using sophisticated energy & heat measurement equipment. The large coating bay can accommodate up to 10 vehicles at a time. “We are offering to UAE motorists a premium car care solutions to keep their vehicle from ageing. Their cars will be in good hands with the world’s most technologically advanced heat control film company”, stated Mr. S. Saravana Natesh, General Manager – V-KOOL Emirates. He added, “Unlike traditional niche outlets that focus on just one service, we at V-KOOL™ Emirates offer an opportunity for our elite clientele to get the complete range of services under our new Car Care program – which is PROTECTION and APPEARANCE”. As one enters the outlet, you are welcomed into the reception area, where an expert associate walks you through the entire product range including a demo experience which will instantly convert you to a raving fan of V-KOOL™ because that’s how magnificently V-KOOL™ films block heat causing Infra-Red (IR) rays and harmful Ultra-Violet (UV) rays. In fact, the entire series of films reject 99% UV rays. V-KOOL™ is the world’s first wavelength selective window coating that provides a virtually transparent protective barrier against the sun’s heat and radiation. There is also the revolutionary Paint Protection Film (PPF) from V-KOOL™, a marvel of emerging technology. Its unique TRU-HEAL property of self-healing minor scratches and tears on the ultra-thin 0.5mil film is a relief for many motorists as they encounter minor scratches from crowded parking lots and high traffic roads. Add to its other properties of Stain Shield, Solvent Guard, Dura Coat, Color Protect and Easy Stretch make it one of the most preferred paint protection application in the industry. The company’s Car Care concept helps protect not just windows and body work, but also extends to interiors, engine and wheel rims, and thereby offering Total Protection. So plan your visit today to V-KOOL™ Emirates flagship store in Dubai to experience the new generation Car Care concept. Your car will love you for it.